Goodreads says, "In The Graces, the first rule of witchcraft states that if you want something badly enough, you can get it . . . no matter who has to pay. Everyone loves the Graces. Fenrin, Thalia, and Summer Grace are captivating, wealthy, and glamorous. They’ve managed to cast a spell over not just their high school but also their entire town—and they’re rumored to have powerful connections all over the world. If you’re not in love with one of them, you want to be them. Especially River: the loner, new girl at school. She’s different from her peers, who both revere and fear the Grace family. She wants to be a Grace more than anything. And what the Graces don’t know is that River’s presence in town is no accident. This fabulously addictive fantasy combines sophisticated and haunting prose with a gut-punching twist that readers will be dying to discuss. 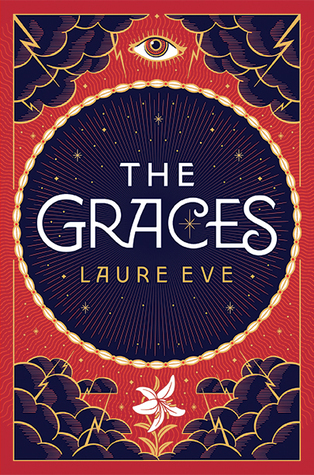 Perfect for fans of We Were Liars as well as nostalgic classics like Buffy the Vampire Slayer and the 1996 movie The Craft, The Graces marks the beginning of a new wave of teen witches." I haven't read a good "witchy" story in awhile. This one sounds promising. What do you guys think? I like the cover. It reminds me of The Diviners by Libba Bray. I think this sounds like it could be really good but I am not a fan of We Were Liars. Maybe I'll check it out from the library just in case. Yes! Very similar! I will definitely let you know what I think after I read it. I am hoping it doesn't disappoint. Thanks for visiting, Christina! Oh it's like that cult hit, The Witchcraft. Sounds good! Enjoy, Christina! Haha. YES! Thanks for visiting, Joy! Definitely sounds promising ~ Hope you enjoy it! Yes, I loved that show! Thanks for visiting, Stephanie. Yes, witchy stories have been hit or miss for me lately. I love the cover, too! Thanks for visiting, Jenny! I love a good witch story. I hope you love it! Me too. I hope it doesn't disappoint. Thanks for visiting. I love witches, and this sounds like an intriguing book. Thanks for choosing this, I'll have to add it to my TBR list. I love books about witches. I haven't heard of this one yet. Good pick. Hope you enjoy it. Have a great week. I'm glad you agree. Thanks for dropping by, Stacey. I think the last "witchy" story I read was Truthwitch, does that count? Not quite the same, I think. :D I love the cover of this book. I hope you enjoy this one when you get the chance to read it! Yes, Truthwitch was the last "witchy" story I read as well and I wasn't in love with it as much as I had hoped for. I like the cover, too! Thanks for visiting, Alyssa. I'm curious as to what your thoughts will be on this one. I may check it out after you read it! Happy Reading :-) Here's my WoW if you'd like to stop by my blog. I'll definitely share my thoughts. Thanks for visiting!